Singapore – WWF has become a founding member and Executive Committee member of the Global Platform for Sustainable Natural Rubber, a multi-stakeholder platform that strives to increase the supply and uptake of sustainable natural rubber in the global marketplace. Unsustainable and illegal natural rubber production has emerged as a top threat to many forests of Southeast Asia and it is becoming an increasing threat in the Congo Basin. Rubber production can have a detrimental impact on forests, through clearing of primary forest that’s home to wildlife such as elephants and tigers, and on people, through land grabbing and poor treatment of local and indigenous people. 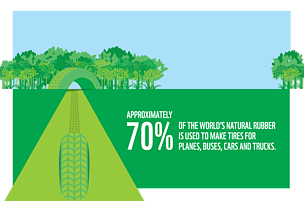 There are 39 founding members of the Global Platform for Sustainable Natural Rubber —12 tyre companies, 10 rubber producers, processors and traders, 3 automobile makers, 11 civil society organizations and 3 affiliate member organizations. Members of the platform will develop sustainable natural rubber standards, as well as mechanisms for—and guidance on—the implementation, monitoring and verification of sustainable natural rubber commitments from companies. Within the past few years, many of the world’s biggest buyers and users of natural rubber—such as Michelin Group and General Motors—have worked with WWF to either create sustainable natural rubber policies or make public commitments to sourcing this kind of rubber. Rubber is grown in Asia, Africa and South America. But Southeast Asia has become the world’s epicenter of rubber production, as climate and soils for growing rubber trees are ideal there. 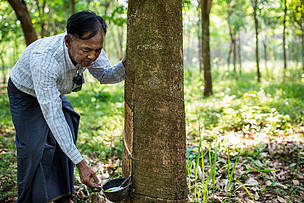 More than 90 per cent of the world’s rubber is produced in this region. Approximately 70 per cent of the world’s natural rubber is used to create tyres and the rest is used to make a variety of products, such as shoes and surgical gloves. Global consumption of natural rubber has doubled in the last 40 years and is expected to continue to grow, in large part to keep up with the expected doubling of vehicles by 2050. WWF promotes sustainable natural rubber at two levels—with the companies that use rubber and the producers who grow rubber. At the company level, WWF’s priority is supporting the adoption and implementation of commitments to produce, source and use sustainable natural rubber. 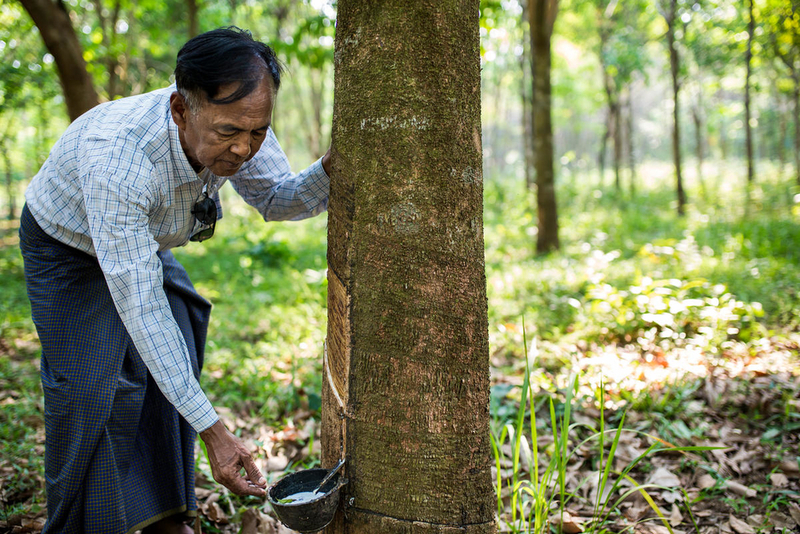 In terms of producers, WWF has initiated projects in Myanmar, Thailand, Indonesia, China, and Cambodia to demonstrate how rubber production can be done sustainably, from a social, environmental and economic standpoint. At the first General Assembly of the platform, WWF was elected as a member of its Executive Committee. The 10-member committee reflects the balance of voting in the General Assembly, where rubber producers, processors, traders and smallholders; tyre makers and other rubber buyers; and civil society each represent 30 per cent of the board. Automobile makers and other rubber users represent the remaining 10 per cent. Once smallholders are adequately represented on the platform, likely by the time of the second General Assembly, they will move into their own voting category. A portrait of rubber farm owners Aung Khon, who has the proper of 12 acres in Pagari village, out side Dawei in Tanintharyi division, Myanmar. 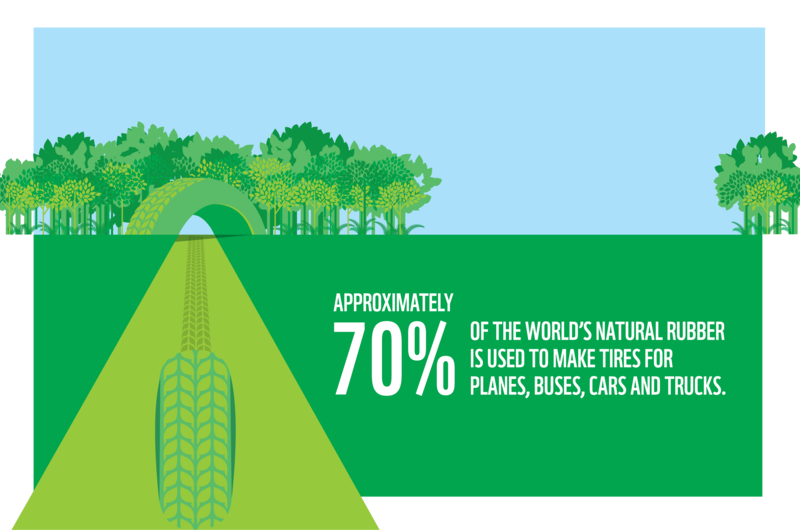 Roughly 70% of the world's natural rubber is used to make tires for planes, buses, cars and trucks.